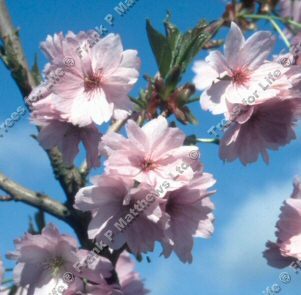 Rufa (Prunus 'Rufa') is an interesting flowering cherry tree with bark similar to P. serrula (Tibetan Birch Bark Cherry). Identifiable by its attractive peeling, reddish-brown and amber bark. Rusty hairy young shoots and small clusters of pale pink flowers. This tree was first introduced in the Himalayan regions. Rufa is supplied at a height of between 1.5 and 2.0 metres in a 12 litre container for year round planting and better results than from either bare-root or rootballed stock.